The adidas NMD train continues to roll, as we now take a look at this upcoming adidas NMD R1 Primeknit Utility Grey Camo colorway. Built with Primeknit, which makes them perfect for the summer, this release will be debuting very soon. Dressed in a Utility Grey and Shock Pink color scheme. 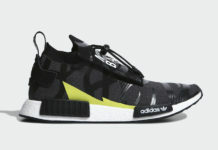 This adidas NMD features a Grey Camouflage printed upper with a sock-like collar, White Boost midsole and rubber outsole. Giving the shoe a bit of contrast is the Shock Pink EVA insert overlays. Look for the adidas NMD R1 Primeknit “Utility Grey Camo” to release later this summer at select adidas Original retailers. The retail price tag is set at $170 USD.